Begun in 1832 as the North Company in New Britain, Connecticut, which made “saddlery hardware” and “tried to satisfy the needs of the rider”. The business grew quickly and was a supplier to the U.S. army during the Civil War and again during the Spanish-American war and even the first World War. 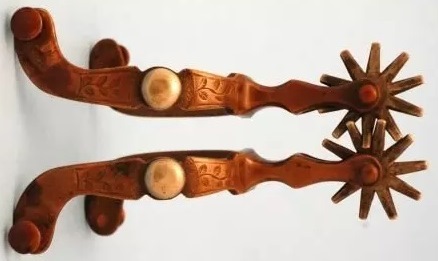 North and Judd produced a wide range of metal buckles, rings, bits, hooks, chains, and other related goods besides the bits and spurs for which we know them. Their trademark was of an anchor usually stamped near the button, but sometimes on top or below the shank. North and Judd bought out the Buermann company in 1926 and continued to use the Buermann name and it was slowly phased out. Click here for information on North and Judd Maker’s Marks.